Yahoo! Local is the popular search engine Yahoo!’s service for finding local business reviews, top-rated services, and events. Since it’s integrated with the Yahoo Map service, Yahoo! Local also includes interactive maps, driving directions, and user reviews and ratings. We here at ReviewTrackers have come up with a guide on how to claim your business listing on Yahoo! Local. Read on to find out how you can get started. Step 2: Sign in using – or sign up for – your Yahoo! account. Step 3: Enter your listing details, including your name, E-mail address, and phone number. Step 4: Enter your business location information, including business name, local phone, address, ZIP code, URL, and company E-mail. Step 5: Enter your business location’s hours of operation and indicate the payment methods you accept. Step 6: Enter additional information about your business – such as year established, languages spoken, brand names carried, services and products offered, etc. – then click Continue. Don’t worry, you’ll have the chance to preview and edit your info before completing the submission process. 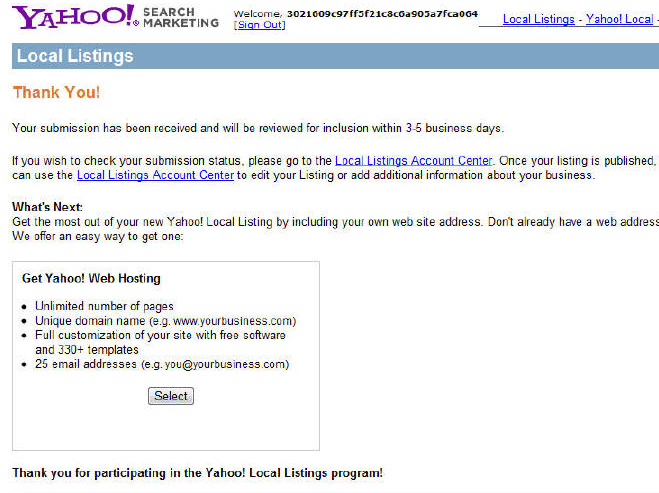 Step 7: If your business is already listed in Yahoo! Local – a bunch of search results will appear on the next page so you can determine that – you’ll have the chance to edit it. If it’s not listed, you can create it yourself by choosing the “Add New Listing” option. Step 8: Select primary and secondary categories under which your business falls. Then fill in your professional contact information on the next page. Step 9: Preview your local listing and check carefully to make sure all the information you provided is correct. Step 10: After you’ve reviewed your business listing information, click “Submit”. Step 11: Verify your submission by entering the Captcha code and reading the Yahoo! Local listings terms of service. And – voila! – you’re done. Just wait 3 to 5 business days for Yahoo to review your business listing. I have a listing that needs to be corrected. Below will be the link.